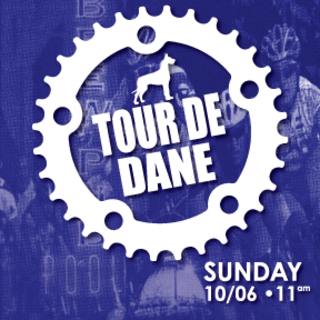 Join The Great Dane and the Trek Store Cycling of Madison for a Dane-to-Dane-to-Dane (Dane3) benefit bicycle ride on Sunday, October 6th. To benefit DreamBikes. Riders will meet at the Great Dane Fitchburg, and the ride will commence and end at the Great Dane in Fitchburg. Participants may choose to ride to all of the three the Great Danes, or to as many they would like. The first 20 riders to register will receive a $10 dollar gift certificate to the Great Dane Pub. There will be snacks/appetizers provided for riders at the Fitchburg Dane, the official finish line. A brewery tour and beer sampling along with games and activities will be available for adults and kids at the Fitchburg Dane. There is a $35 registration fee of which 50% of the total amount collected will be donated to DreamBikes. We will also be accepting donations to help Dream Bikes. There will be a rider liability waiver and rules signed by participants at check in table the day of the event. Great Dane Pub Cycling Jerseys. One full Growler with a koozie. Great Dane pub Cycling jacket. Plus many other prizes and giveaways!